Thematic Funds, Sectoral Mutual Funds - Good for Investment? Home » Mutual Funds » Thematic Funds, Sectoral Mutual Funds – Good for Investment? Thematic Funds or Sectoral Mutual Funds are among few popular investment options. There are many success stories of earning roller-costar returns from the sectoral mutual funds. Looking at popularity and returns you might be interested in investing in Thematic Funds or Sectoral Mutual Funds. Before taking a decision of investing in these funds. Let’s look at What is Thematic Fund? Is it a good idea to invest in sectoral mutual funds or not? A Thematic Funds or Sectoral Mutual Funds are theme-based funds. As the name suggests, these funds invest in the specific sector or industry. 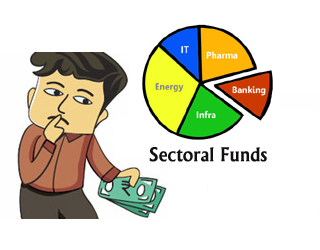 The returns of sectoral funds are highly dependent on industry or sector where they invest. There is no diversification of investment in these funds. These types of funds are recommended only for high risk aggressive and informed investors. If you are new to stock market you should avoid these funds. There are various types of thematic or sectoral mutual funds. Few common categories of funds are given below. Pharma or Health Care Funds – A mutual fund which makes an investment in stocks of pharmaceutical or healthcare related companies are known as pharma or healthcare funds. Banking Funds – A fund that invests only in the banking stock is known as banking funds. Technology Funds – A mutual funds that make an investment in IT companies stocks are known as technology funds. FMCG Funds – These mutual funds invest in fast moving consumer goods companies. Infrastructure Funds – The fund which makes an investment in infrastructure, metals, energy, and construction are known as Infrastructure funds. The benchmark index of every fund is different. E.g For infrastructure fund Nifty Infra is benchmark similarly for FMCG, S&P BSE FMCG is the benchmark. Should you invest in Thematic or Sectoral Mutual Funds? If you are a highly aggressive investor you can think of investing in these funds. You should limit exposure to these funds up to 10% and invest only those funds which compliment your current portfolio. Before making an investment in the sectoral fund, you should ask following questions. A sector where you are investing is undervalued or not? – There is no point in investing in the overvalued sector. What are the triggers that will help in boosting the performance of the sector? – If you don’t find two-three trigger points you should not invest in that sector. How long will you keep your investment? – You should estimate the time period up to which sector will continue flourishing. What will be your allocation in the specific sector? How much money you can risk and what will be your exit strategy? If you have sure shot answers of above question you can opt for thematic or sectoral mutual funds for investment. Sectoral Mutual Funds provides portfolio hedging to the investor. Let me give you an example currently the entire stock market is outperforming, but pharma and healthcare sector is not performing. However, a new social initiative of boosting health care by the government of India and probable FDA relaxation will be a trigger point for the healthcare sector in days to come. Similarly, the petrol price is increasing which is adversely affecting the economy and driving inflation at a higher level, but it is beneficial to energy sector companies and mutual funds. One thing you should understand when you invest in these types of funds is a performance of the fund is not guaranteed. A chance of gaining and losing money both is high. This means it is advisable to limit the exposure to these funds. You should decide the investment horizon before making an investment in this fund. A sectoral fund is not recommended for a short-term period. You should keep an investment horizon of at least five years while investing in thematic funds. The selection of the sector is important while investing in these types of funds. Apart from the sector, you should also select an entry and exit point carefully. You should not invest in the sector which is overvalued. Tracking portfolio is essential when you are making an investment in the thematic fund. You should have time to track portfolio and related news about a sector where you have invested money. Please remember that every sector goes through a cyclical phase of rising and fall in the specific investment horizon. Do you prefer investing in Thematic or sectoral mutual funds? Please share your views in the comment section given below. « Credit Card Statement – How to Read and Understand?